Toward the end of August I went out to the West Coast to visit my Mother at my Aunt's place for the former's birthday. My Aunt lives south of Portland, Oregon in some righteous farm country. Blueberries, pumpkins, corn...hops. It's beer central there. Walking into a grocery store beer section there is akin to walking into the world's greatest beer distributor. We took a drive up to White Salmon, Washington on one of my last days in town for a family reunion of sorts. I met numerous cousins of various degrees and removals. Each and every one was impressive. Hoofing it back to Oregon in the evening, we were somewhat vexed as to what to do for dinner. I wanted steak. More importantly I wanted to take my first opportunity to cook steak on a grill and I wanted to do it in my Aunt's beautiful back yard. Picked up a pair of fantastic chops at the grocery store. 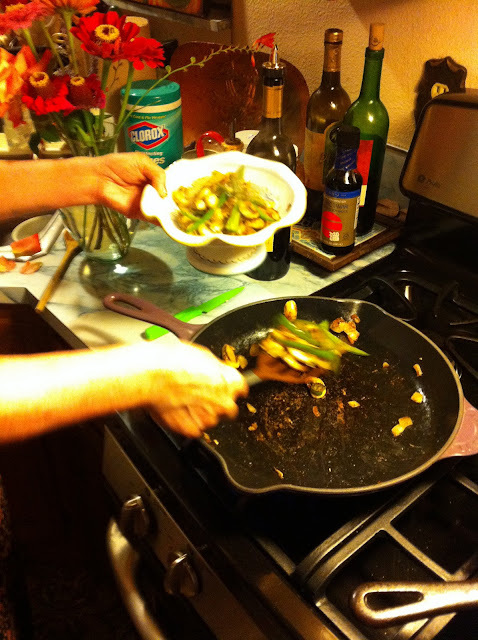 Mom sautéed fresh jalapenos, onions, and mushrooms. One of the wickedest beers I've ever had I picked up at the grocery store. The Deschutes Hop in the Dark was a taste bud tap dance inducing ambrosia of sensation. 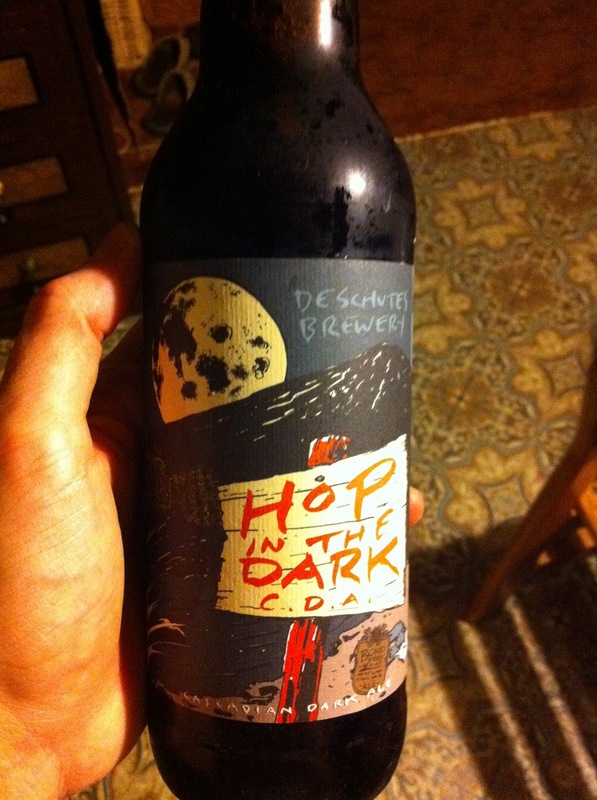 Looks like a porter because it's dark, but hoppy like a double IPA. Please bring this to Astoria! I can't get it here. Here's the final table set. 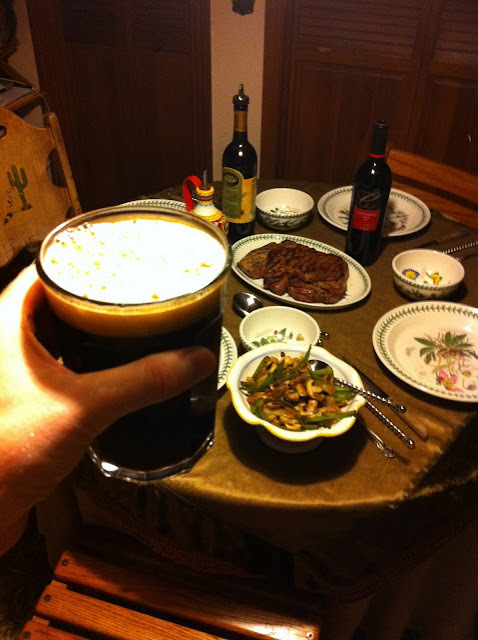 That's the Hop in the Dark in the foreground, the sautée in the mid-ground, and our steaks in the centre of the table. Overall my first steak grilling experience worked out well. I got one steak to a medium rare and one to a medium. 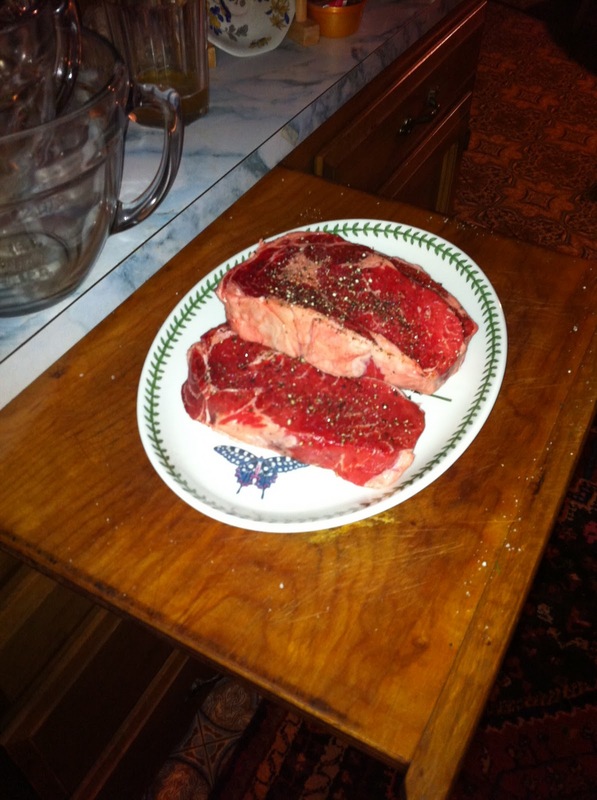 Rare is what I prefer, but I had no experience cooking steak over charcoal, so I wasn't too fussed. Your soundtrack for this entry: Dot Allison - Colour Me. Jeremy: Best steak EVER! And YOU cooked it. Your "former's" onions and peppers sublime. Could you please come back so we can do a re-wind? Xoxoxoxoxo, Auntie Mad. PS: If only the Clorox wipes didn't look as though they were a part of that fabulous meal!